ITEM: Perhaps one day I’ll be “carbon neutral” by not purchasing too much more “stuff” that will ultimately need disposing of. However I recently added loads more collectables rubbish to the skip (and ultimately landfill I presume). One box was full of 8 track cartridge tapes. It’s not like I ever played them. Most had lost their outer sleeves and they all looked tatty and water-stained. I believe I found them in the back of a second-hand Triumph GT6 I once bought. The 4 track cartridge first appeared in the early 1960s and soon found favour at radio stations. Jingles and adverts could be set up on the tape loops so once they had been played they were all ready to go the next time. Players were soon developed for cars to exploit this new format. At least they were an improvement over the car-dashboard-mounted 45rpm record players from a few years earlier. 4 track cartridges were rather clunky as they required you to push one of four buttons to move to the next part of the tape. So the format was soon improved and called “8 track” , but not made backwards compatible with the earlier system. Although called 8 tracks there were still only 4 “programmes” (presumably they now had the capacity to be in stereo) and at least they now played in sequence without too much button pressing. By splitting two-sided LPs into four you often found the ludicrous situation where a tune stopped halfway through as the tape moved over to the next track. Take this example here. “Nowhere Man” isn’t much more than 3 minutes long and yet they’ve chopped it in two !! Surprisingly you (not me !!) could still buy these pre-recorded cartridge tapes until the early 1980s (often in racks at Car Accessory shops) despite the Philips cassette tape being most people’s preference at home and in the car. PS: I actually still own a Lloytron Music Centre which plays 8 track cartridges as well as LPs. I believe it also RECORDS onto 8 track tape too which is rather unusual. Another novelty I’ve still kept is a contraption that you push into the cartridge slot which enables you to play a cassette tape through your 8 track cartridge system…apparently often found in glove boxes in early 1970s Rolls Royces. ITEM: Stacks of books went into the skip but as usual at the last minute I had second thoughts and rescued something. This time I decided to reprieve a dozen Broons Annuals. D.C.Thompson’s Beano characters now inhabit the C21st and yet Oor Wullie still continues to sit on his metal bucket (??). Didn’t he ought to be sitting on a Wheelie-Bin by now ?? ITEM: Feeling proud of myself that I’ve disposed of so much stuff I immediately order half a dozen new graphic novels. “Models Inc” looks interesting as it features Millie the Model, Chili, Patsy, Hedy and more !! All the Marvel Comic characters have gone through some massive changes over the years but they certainly haven’t aged. In normal time Millicent would be 80 years old by now. Patsy Walker looks good for her age too. From her romance comic origins Ms Walker is now a “Marvel Diva”. I really enjoyed this 4 part series with its tales of Patsy and her “gal pals” shopping, drinking coffee in hospital waiting rooms and visiting her ex-husband in Hell (??). Highly recommended. PS: Did you know that Patsy Walker was first seen (along with her friend Hedy, but surprisingly not Millie the Model) in the official “Marvel Universe” in 1965 as a guest at Sue and Reed’s wedding in Fantastic Four Annual No 3. I suppose the next thing will be a plague of frogs. Thanks to the volcanic ash blowing down from Iceland there won’t be any new comics this week. And there’s still no sign of my parcel from Amazon.com. Air freight has been curtailed along with the passenger flights. Ironically the sky has never looked bluer thanks to a lack of planes. I wonder if they will dare produce any figures to show how much less CO2 has been emitted over the last week or so. Although the UK version of Fantastic Four still states that it is “The World’s Greatest Comic Magazine”, it is over 3 years since the original comic used that sub-title. Stan Lee introduced the claim way back in issue No 4 in 1962 (and perhaps whilst Jack Kirby provided the art, the fans agreed) and amazingly it was still there above the title as recently as 2006 (although personally I think it should have been removed in the early 1980s). So the question now is this: what should be the current holder of the title “World’s Greatest Comic Magazine” ?? It certainly isn’t “Invicible” which far from being the best comic in the universe is possibly the worst comic I’ve read all year. 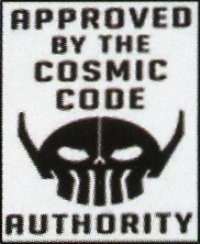 Whilst reading Fantastic Four 572 another surprise was seeing that they still print that “Statement of Ownership Management and Circulation” small print. These evidently legal requirements (something to do with second class postage??) have appeared periodically (annually??) for as long as I have been reading comics. The only change I have noticed is the drastic decline of the numbers of comics printed and sold. I used to be amazed that often Charlton comics would give a figure for the print run of an issue and a figure for unsold issues/returns which was at least 50% of the original figure. Surely it wasn’t cost effective to print so many and yet have so many unsold. I assumed that those “unsold” comics would end up in the UK a few months later. So, according to the small print in Fantastic Four 572, currently only around 15000 issues per month of what was “The World’s Greatest Comic Magazine” are now sold !!!! Co-incidentally I’ve just been flicking through some old comics. Iron Man 170 coverdated May 1983 also contains one of those “Statement of Ownership” thingys. That title was then averaging 360,000 issues per month and it wasn’t even Marvel’s best selling title. Hmmm, if the downward trend continues perhaps new comics will soon only be available on your iPad (whatever one of those is). It’s a good job that my “to-read” pile of proper paper back issues is taller than I am !! Perhaps “Spiderman” still sells more but it begs the question of how well some of the lesser titles are doing. Perhaps it’s true that all new comics are produced these days with the creator’s eyes firmly fixed not on magazine sales but on the potential of far more lucrative spin-offs into TV, Film or even cartoons. Comments Off on The World’s Greatest Comic Magazine ?? The first phase of Radio Caroline began Easter 1964. Within months the station was incredibly popular and broadcasting from two ships to ensure coverage of the whole UK. Like all the other Offshore Commercial Radio Stations of the mid 1960s Radio Caroline fell foul of the Marine Offences Act, quickly lost DJs and advertising revenue and struggled on until finishing in early March 1968. Radio Caroline Phase Two began in late 1972 with the Mi-Amigo back in the North Sea. A far more low-key operation this time. An initial Top 40 format was soon replaced by a Hippy/Loving Awareness/Album Station/Freeform anti-format. When the old, badly maintained ship finally sank in 1980 I assumed the era of Pirate Radio was over. Radio Caroline Phase Three began with a blaze of publicity in 1983. A new, bigger, better ship, the Ross Revenge, had been sourced. Here is an audio only extract from a news report on UK TVs Channel 4 News in 1983 just before broadcasting re-commenced with Ronan sounding optimistic. The impetus of the 1983 re-launch slowly petered away. Ronan’s much-promised advertising never really materialised. Technical problems were numerous with most of the enormous 300 foot mast eventually collapsing and never really being successfully repaired. On August 19th 1989 Radio Caroline was raided by UK/ Dutch authorities and much broadcasting equipment was smashed up or removed. Here is an audio clip from August 19th 1989 during the boarding and forced closedown of Radio Caroline. Over the next six weeks the studios and transmitters were cobbled back together by Peter Chicago and broadcasts re-commenced on low power on 1st October 1989. Here is a lo-fi audio clip of Radio Caroline from October 9th 1989. Peter Chicago is closing down for the night at the rather early time of 6pm. The time and the fact that Chicago (who preferred engineering) was having to present a show is evidence that the station was still struggling back into operation after the troubles with the DTI and the Dutch authorities in August (They had been off air between August 19th and October 1st 1989). The Radio Station never really recovered from the subsequent loss of Dutch daytime programming which had paid for food, fuel and tenders and had supported the English broadcasts. Despite the best efforts of a small, dedicated band of enthusiasts the station finally faded from the airwaves in November 1990 when the fuel, money and willing staff finally became too depleted. I’ve just finished reading this interesting book. Its a first-hand account of this third phase of Radio Caroline by Steve Conway who spent a lot of time on board the Ross Revenge in the second half of the 1980s and was there until the bitter end in 1991. A visit to this detailed site will provide you with a timeline of the major events happening to Radio Caroline in the late 1980s showing how often they were on/off air. And there’s loads more info all over the Interweb. Even YouTube has some fascinating video. In the 1990s onwards another phase of Radio Caroline began utilising local limited-period broadcasting licences and via Satellite (Sky Radio Channel 0199) and the Internet (www.radiocaroline.co.uk).